+ 4 foot tide. Stay in channel to West side. There is a water depth marker on the East side of the basin as you enter the Day Island Lagoon. Keep it to your Port side on en-try by the boathouses. Then keep the 3 green day marks to port on entry to the recip dock. Ground Floor of the Club House to sign in. Both 20A and 30A shorepower available. Yellow line on dock indicates low water at Low Tide. Pump Out station available on dock. 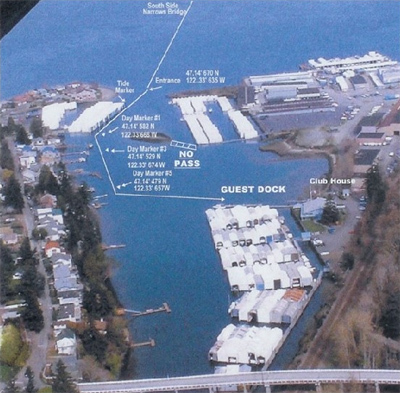 We are located on the West Side of Tacoma/University Place, one mile south of the Tacoma Narrows Bridges.